Do you always keep misplacing your pencils in spite of owning many pencil cases over the years? Are you constantly frustrated with poor quality colored pencils that keep breaking off after every sharpening? Your search draws to an end right here, right now! Presenting The CrewbieStore 48 Watercolor Pencil Set! Our amazing pencil set includes 48 bright and vivid pencils that will make your day. Whether for painting, drawing or simply passing the time, these pencils will color your stress away. Plus, they make for an amazing gift for your children or grandchildren. Kids absolutely love coloring & painting and you know it! However, you wouldn't want to start losing your brand new pencils, would you? Custom Wool Felt Rollup Pencil Organiser Holder! Quite a mouthful, don't you think? 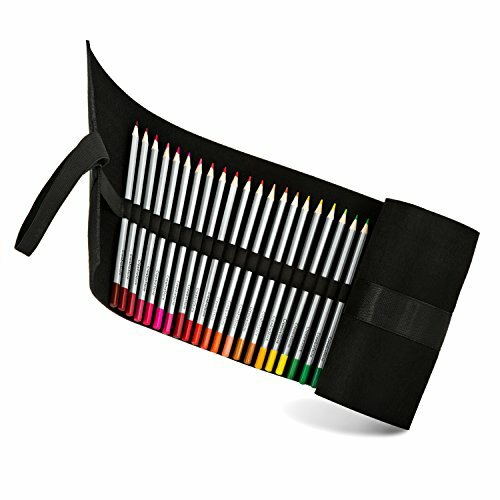 This pencil organiser wrap, however, is your long-term solution to never misplacing your pencils! With 48 durable slots, this case can hold, protect and organise up to 48 pencils and since you can roll it up, it's entirely portable and convenient to store. The entire pencil wrap comes in a small, tote bag which you can throw in your school or office bag and take your pencil set everywhere you go! Knowing that our premium pencil set is covered under the umbrella of CrewbieStore's no- questions-asked, refund guarantee, there's really nothing left to do but..
Scroll Up, Click 'Add To Cart' & Start Painting! NO MORE MISPLACED PENCILS! -This art set is your solution to storing and never losing your pencils. It comes with 48 bright and vivid colored pencils and a custom, rollup wrap-holder with 48 pencil slots. Every single loop was made to keep your pencils protected and secure, holding them tight enough that they won't go flying out while carrying them! STYLISH PENCIL ORGANISER! -Whether for your office, your desk or for school, throwing pencils in your bag is not convenient at all! Our wool felt wrap is designed to keep your pencils nice and neat without losing its shape. Both the elastic straps holding in the pencils and the one wrapping the bundle are strong and durable. AMAZING WATERCOLOR PENCIL COLLECTION! - The CrewbieStore pencil collection includes 48 top quality watercolor pencils that blend BEAUTIFULLY. Vivid colours, use your paintbrush or dip the pencil straight into water! They are absolutely perfect for painting, drawing and sketching at home, at school or at work, you don't need to press very hard to get stunning colours. KIDS LOVE THESE WATERCOLORS! - Wet paint or Dry colour , let them PAINT & COLOR the hours away - Happy Kids, Happy Mum & Dad! 100% RISK-FREE PURCHASE! -Our brilliant pencil collection is manufactured with meticulous attention to detail. After all, we use these pencils all the time as well! That's why we want you to get in touch with us if you encounter ANY issues with your order and we'll issue you a full refund...no questions asked! If you have any questions about this product by CrewbieStore, contact us by completing and submitting the form below. If you are looking for a specif part number, please include it with your message.